In 2011 we were asked to renovate the dilapidated basketball court on the Twentymans playing fields. We began with a whole village consultation process this included talking to local schools and youth groups showing them our plans and changing/updating as suggested. We also sent a questionnaire to all residents of Bilbrook and invited them to a consultation meeting which we held in Bilbrook Village Hall. After obtaining three quotes from contractors, we sat down and went through all the quotes with a fine tooth comb. 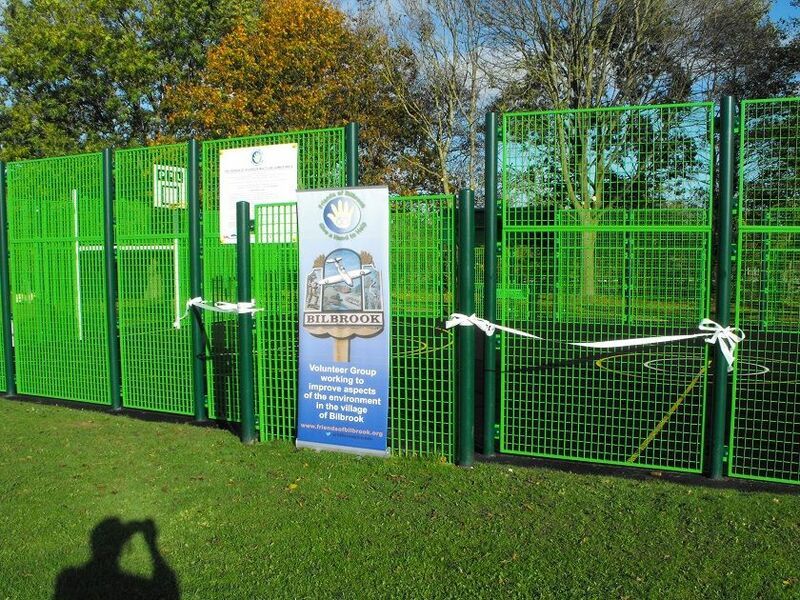 Eventually we decided to go with Parkdale Play Limited, a company with a proven track record of MUGA installations. Then came the hard part, we started to apply for funding. After being turned down many times, the project was eventually funded by Biffa Awards, South Staffordshire District Council (SSDC) and South Staffordshire Housing Association. The total cost of the project was £46,057. Installation began in September 2012 and took 2 weeks to complete. The opening day was well attended by all those who had helped us to get the MUGA. The facility was opened by the Rt Hon Gavin Williamson and Maggie Quinn from South Staffs District Council. After installation, we provided free sports coaching to all ages of the community with a grant from SSDC. This was delivered by Zoom sports coaching and proved to be very popular. It may have taken 2 years of sweat, blood, tears, form filling and overcoming many obstacles but all the effort was worth it. It in constant use by all ages, encouraging the residents of Bilbrook to be fit and healthy and improve their wellbeing.